If you’ve been cycling for a while, you likely know that the goal almost all competitive cyclists is to be as light and strong as possible. This not only includes the strength and weight of your body, it also includes the strength and weight of your bike. After all, cycling weight comes down to simple physics – the more or less you weigh, the more or less energy it will take to pedal your bike. But what cycling weight is best for peak performance and how is it best achieved? This two-part series will answer these questions. What’s the Ideal Weight for Cycling? Let’s start by looking at the size and weight averages of world champion cyclists over the past 12 years to show the ideal weight range needed to compete on a very high level. The easiest way to do this is to average each rider’s weight in pounds per inch of height. 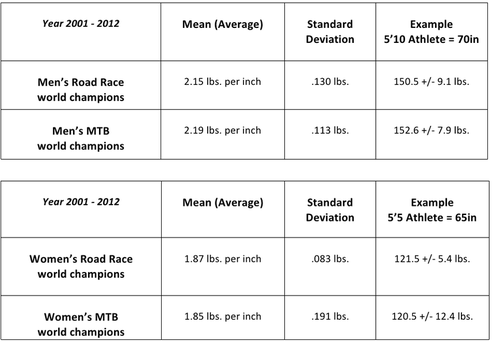 The table below shows the average weight per inch of height for men and women road and mountain bike word champions1,2. As you can see, to compete on the world’s highest level you need to be light in weight – specifically, approximately 1.85-1.87 lbs per inch for women, and 2.15-2.19 lbs per inch for men. But body weight is not the only factor in elite performance – being as strong as possible while maintaining a healthy light weight is the key. Power-to-weight ratio is the formula used to determine your strength compared to your weight, and it’s the great equalizer when comparing riders of different sizes. The higher your power-to-weight ratio the faster you will go. Power-to-weight ratio is calculated by dividing your body weight in kilograms (1 kg = 2.2 lbs) into average watts for a given range. For example, if you can produce 300 watts for your functional threshold power (FTP, about a 60 minute time trial effort), and you weight 74 kg (163 lbs), your power to weight ratio is 4.05 at your FTP range. This means you can generate 4.05 watts for every kilogram of body weight. A power to weight ratio of 4 to 4.5 is equivalent to a competitive Category 2 racer. A power to weight ratio of 5-6 would put you in the range of a Category 1 elite professional (according to Andy Coggan’s power profiling chart). So what this means for any cyclist is that the greater your strength compared to your weight, the faster you are going to be on the bike. Two important aspects of this equation are the loss of body fat while maintaining or increasing lean muscle mass and strength. However, there are limits to how much you can or should lose in body fat as well. The minimum body fat range for men is 6% and for women is 14%3. Dropping below these ranges can negatively affect your health and performance. But if you are nowhere near these body fat ranges and have a goal to lose weight, then losing a few pounds in body fat can lead to a big difference in your strength on the bike. Your starting strength to weight ratio at FTP is 280 watts divided by 84 kg = 3.33 w/kg, equivalent to a Cat 4 racer. Strength to weight ratio at FTP = 280 watts divided by 77 kg = 3.64 w/kg, equivalent to a competitive Cat 3 racer. This means this athlete gained .31 watts per kg of body weight at FTP. If you take .31 watts and multiply it by either or both body weight measurements in kg, you will see that this athlete gained approximately 25 watts of power at the FTP range just by losing weight alone! Now let’s say that through smart training the athlete made a 10 watt gain at the FTP range. That would increase strength to weight ratio to 3.77 w/kg, a .44 w/kg difference and equivalent to approximately a 35 watt gain in power in the FTP range! That is significant. 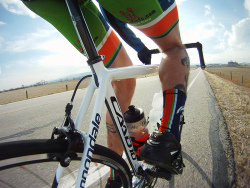 In short, there is a lot to gain as a cyclist by reducing your weight, including climbing faster, and even more to gain by simultaneously getting stronger, but achieving an ideal race weight happens with smart decisions and hard work. Part 2 of this article will look into losing weight both on your body and your bike, including proper weight loss guidelines for endurance athletes.